In later years my father's ill health affected the program of maintenance, and by the late 1990's the box and railway were becoming scruffy and dilapidated. As each winter passed we became more concerned about its long term future. When the box was finally finished, work progressed on other projects around the railway. A set of points was built and a branch line was constructed alongside the A4 road towards Reading, a total of 660 feet of track were eventually laid, with the spur being worked by token. Following the closure of the line from Bourne End to Wycombe my father bought two tons of scrap from BR and we spent many weekends removing signalling hardware from the Bourne End sidings, many of the gantry signals were erected in our garden and controlled from the signal box. My father's work as a Water Drilling Engineer took him to many places round the world, but in January 1969 he was planning a new drilling contract near Mouldsworth in Cheshire. During the long evenings away from home he would spend time chatting to the Signalman at Mouldsworth Dwarf Frame, although at the time he couldn't have foreseen the events which were to come. 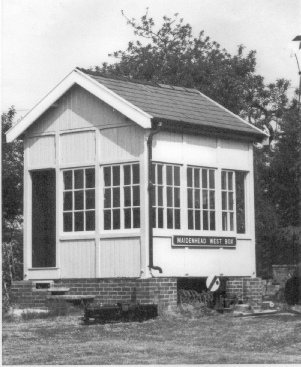 Soon afterwards, as part of rationalisation, the Mouldsworth box was decommissioned and put up for sale. At the same time the Mouldsworth drilling contract started. My father immediately bought the signal box and a collection of other equipment for the sum of £10-10s-00d. However, there was one condition - The Purchaser had to take care of Removal and Transportation. Over the next few weeks he worked on the drilling contract by day and spent the evenings dismantling the levers and frame. At weekends he would arrive home in Littlewick Green with a boot full of cast-iron, his car on the bump stops at the rear with the headlights shining in the trees. Removal and Transportation were the next hurdle, and it wasn't until nearly a year later that the Mouldsworth drilling contract was finished and one of his employers vehicles would be in the area. In the meantime vandals smashed the cast-iron stove and all but three window panes -the surviving panes are still visible today in the top row at the front. On the day of the move, 29th January 1971, all rail traffic on the line was suspended for 30 minutes as the box was lifted clear of its resting place for 77 years onto the Low Loader. Because of the abnormal load, police permission had been obtained for the entire journey from Mouldsworth to Littlewick Green. The 186 mile journey was not without incident: at one point the driver of the low loader had to use the fast lane of the motorway to avoid a low bridge which was actually lower on one side than the other. Another incident involved a roof slate slipping and narrowly missing a very grumpy old lady; when contacted by the police my father pleaded innocence and somehow got away with it. Following arrival at Littlewick Green the box was initially placed on railway sleepers, during the next few weeks the box was jacked up and a brick supporting wall was built underneath. The frame was re-installed, all instruments installed and connected to a second control point in the garage. This allowed the circuit of track to be divided into two sections, each controlled by its own signal box. Block instruments (LNWR Fletchers types obtained elsewhere) in each controlled train movements.